But for those who want even more power, there is the AMG Performance package which sees output increase to 557bhp and 800Nm. Both variants of the CLS 63 AMG achieve exceptional performance: acceleration from 0-62 mph takes 4.4 and 4.3 seconds respectively, and the top speed is 155 mph (electronically limited). The major difference between both power units is the increase in the maximum charge-air pressure from 1.0 to 1.3 bar. In addition, the CLS 63 AMG with the AMG Performance package features a special high-quality carbon fibre engine cover, a genuine carbon fibre AMG spoiler lip on the boot lid, red-painted brake calipers and an AMG Performance steering wheel with Alcantara inserts in the grip area. Despite a significant performance increase compared with the previous model, which had a naturally aspirated AMG 6.3-litre V8 engine producing 514bhp and 630Nm of torque, the new CLS 63 AMG is some 32 per cent, more economical. The claimed consumption of 28.5mpg equates to a CO2 output of 232 g/km and both performance variants have identical fuel consumption and CO2 figures. A major contribution towards achieving the fuel consumption figures has been made by the AMG Speedshift MCT 7-speed sports transmission, a component used exclusively at Mercedes-AMG. Unlike a conventional automatic transmission, the MCT transmission does away with the torque converter; instead, it makes use of a compact, wet start-up clutch. Also fitted as standard is the stop/start function: it is permanently active in the transmission's Controlled Efficiency ("C") mode, and switches the eight-cylinder engine off when the car comes to a stop. At the same time, "C" mode also means a "soft" accelerator response set-up with convenient and early gearshifts; moving off generally takes place in second gear. A green "ECO" symbol in the AMG instrument cluster shows the driver that the stop/start function is active. The engine and transmission come across as much more agile in the "S" (Sport), "S+" (Sport plus) and "M" (Manual) modes; in addition, the stop/start function is switched off. In "S" and "M" modes, the engine management system partially suppresses the cylinders: interrupting ignition and injection under full load leads to even faster gearshifts than before. The highly emotional vocals are an appealing side effect of this lightning-fast process. An automatic double-declutching function and Racestart function are also included as standard. The suspension, steering and braking system of the new CLS 63 AMG complement the high-tech drive system perfectly. The AMG Ride Control sports suspension, with steel suspension struts on the front axle and air suspension struts on the rear axle, as well as automatic level control, is enhanced further by an electronically controlled damping system - it automatically adjusts the damping characteristics depending on the driving conditions and reduces the roll angle of the body. The CLS 63 AMG is the first passenger car in the world to offer LED High Performance headlamps, which combine the LED technology - similar to those of daytime running lamps - with the performance of xenon lights. Fitted as standard, the headlamps, with their 71 LED lamps in total, underline the unmistakable appearance of the CLS 63 AMG. The light specialists from Mercedes-Benz have for the first time been able to use LED technology in the Adaptive Highbeam Assist. 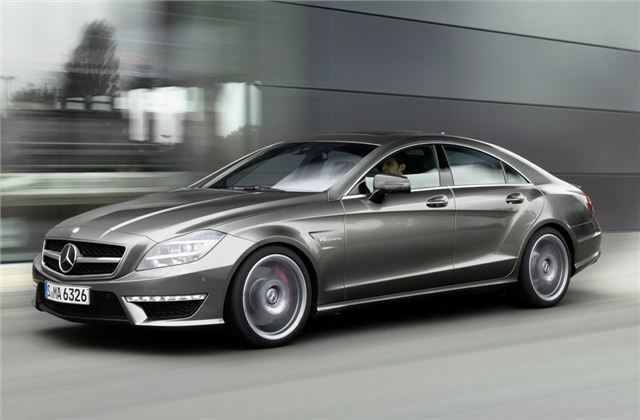 All of the AMG-specific design and appointment features ideally supplement the redesigned CLS interior. The extensive range of standard appointments also includes AMG sports seats in nappa leather, a new three-spoke AMG Performance steering wheel with aluminium shift paddles and flattened top and bottom sections, and the AMG DRIVE UNIT with compact E-SELECT selector lever.